"I've got a case for you, Kelly." Mr. B's pale eyes glinted behind his spectacles. ....I said, "Okay." Very cool. ...."It's out at the Beauchamp place. The butler was found Sunday afternoon shot to death in the sunken garden. ...."Gee," I said, "Somebody forget to polish the silver?" ....Mr. B. was not amused. He gave me one of those long level looks that turn strong men to blue goo. Luckily I'm not a strong man -- or even a man. I said innocently, "Aren't the cops on the job, Mr. Brannigan?" ...."Yeah, try not to trip over them. We've been called in by the family." He handed me a copy of the L.A. Times. I skimmed the story. The Beauchamp's butler had made the front page. ....There wasn't much to read. Mr. Benjamin Jones, a British subject, had been found shot to death on the Westwood Hills estate of the Beauchamp family. Jones, who had butled (butled?) for the prominent Angeleno family for the past seven years, had been shot three times in the back by an unknown assailant. Jones had no known enemies and the police had been unable to discover a motive for the slaying. ...."Gambling debts," I said, handing the paper back to Mr. B. "Racketeers." ...."You think so?" His thin mouth quirked in that sarcastic way he has. "The family think otherwise. They believe it's the curse of the mummy." ...."Whose mummy?" I asked blankly. ....Mr. B. was dry as grave dust as he replied, "Princess Inyotef, an ancient Egyptian mummy discovered last summer on an archeological expedition in Egypt, and currently residing on the estate." ....Anyone else, and I would have figured it was a gag, but the boss has no sense of humor. ...."Does her highness pack a gat? ...."She packs a powerful curse, or so I understand from David Beauchamp, who hired us. You know the sort of thing: He who disturbs this tomb shall suffer a thousand deaths." Brannigan smiled a malicious smile. "They need someone out there tonight. So, Kelly, you can see why I thought immediately of you." ....The nurse's uniform was too tight. You'd have thought a man who had been married would be better at sizing women. Then again, Mr. B. probably regarded me more in the light of office furniture than feminine pulchritude. I shifted uncomfortably in the ivory leather back seat of the Daimler limousine, and caught the beady eyes of Jeffers, the Beauchamp chauffeur, in the rear view mirror. ...."I understand you folks have had some trouble recently," I said, hitching forward to better converse as we headed out on Beverly Wilshire Blvd. ...."Some." Jeffers had a birthmark in the shape of a fuzzy pyramid on the back of his neck. It disappeared into the artificial black of his hair. The smell of cheap pomade reached my nostrils. He seemed like an unlikely vassal for the Beauchamps. ....The dark eyes flicked to mine again. "That's what they say." ....A shrug of uniformed shoulder. ...."Do the police have any leads?" ....Jeffers drawled, "Do I look like I work for the police?" ...."Curiosity killed the cat, sister." ....That was that. I slid back in the butter-soft leather and stared out the window at the same moon that had shone down on those old Pharaohs' giddy heads. Mentally, I reviewed Brannigan's notes on the murder and the Beauchamp family. .....Dr. Phineas Beauchamp was, of course, the noted Egyptologist. He believed the butler's death was somehow related to an attempt to steal the mummy of Princess Inyotef, which had been discovered the previous summer -- this according to his son, David. David was the eldest son. When he wasn't digging up ancient civilizations, he taught archeology at UCLA. 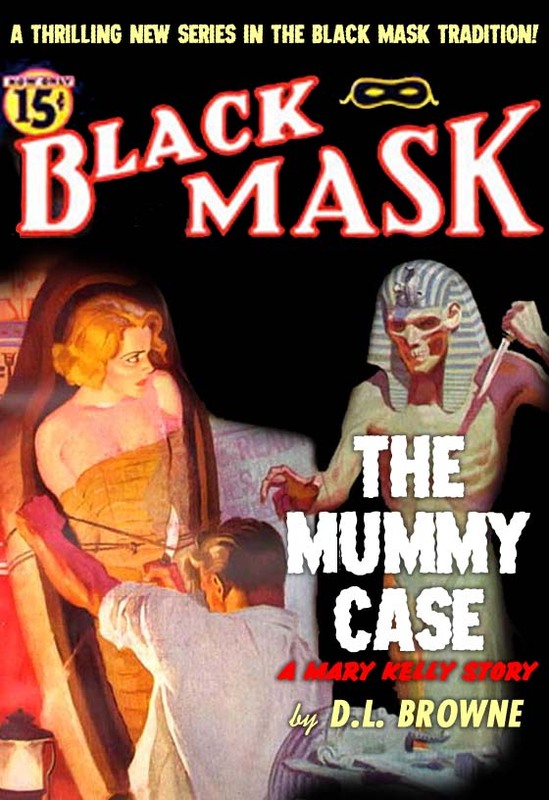 He had hired Branningan's Investigations to get to the bottom of things -- and to protect his wife, whose nerves were apparently affected by the mummy's legend. That was the reason for the uniform. My cover was private nurse. ...."Know anything about nursing?" Mr. B. had asked. ...."I had my tonsils out when I was a kid." ...."Hell. If anyone gets sick, stay away from them." ....There was a younger son as well: Drew. He was a college kid attending UCLA. And that did it for the Upstairs. Downstairs there was a cook, two maids, Jeffers the chauffeur, a gardener and a vacancy for butler. ....This completed the list of on site suspects, unless we dusted off Princess I. ....Somehow, a few months earlier, Brannigan discovered I was trying to write stories for the pulp magazines. That was the reason behind his crack about this being my kind of job. I guess the boss didn't think much of my work, either as an op or a writer. But he was giving me my shot with the Beauchamp case, and I was determined to prove myself. ....We glided along, racing the moon for a few miles until the Daimler turned off onto a narrow dirt road. The road wound up through hills of chaparral, and the smell of dust and sage drifted into the expensive car. Below, we could see the lights of Los Angeles twinkling like scattered stars on a summer's night. It gave me a melancholy feeling, like everything I knew and loved was in the past, out of reach. The chauffeur switched on the radio: somebody's dance band at the Palomar Ballroom. ....At last we drove through a pair of tall iron gates built to withstand a French Revolution or two. Spear points topped the fence, perfect for displaying heads of hapless peasants. ....The house was a transplanted chateau: weathered stone, sloping mansard roof, rectangular windows with moonlight-colored shutters. It seemed a little out of place in the Westwood Hills where the Janss Corporation was busy selling pseudo English Farmhouses with "huge barbecues" at thirteen grand a pop. ....Jeffers let me out, handed over my bag and left me there on the village green, driving off around the house to where they stashed the garage. It was quiet after the sound of the motor died away. ....I picked up my bag and scooted. ....The seasonal Santanas whispered through the cypress trees, hot like someone's breath on the back of your neck. I shivered, though it was a warm night. Even the moonlight seemed to carry wattage. ....A maid answered the door. She was tall, dark and sensible looking. Maybe it was the eye glasses. I'd never seen a maid in glasses before. Not that I'd had a lot to do with maids. I made my pitch and she heard me out. ...."We were expecting you earlier. The household has retired for the night," she informed me. "I guess Dr. David will see you in the morning." Behind the specs her round pale eyes were sizing me up. ....I wondered if I ought to ask to see my patient, but decided it was smarter to postpone that as long as possible. ...."You didn't bring much with you, did you? " Sally, the maid, observed as we headed upstairs. ...."You can never tell how these nerve cases will go," I replied. ...."Oh. Yes. I suppose that's true," Sally said doubtfully. ...."It's a big house, isn't it?" I offered as we rounded the first bend in the staircase. ...."A long way from town." ....Sally started as a tree branch scratched against the window. Gnarled, shadow fingers seemed to reach into the stairwell for us. ....I said chattily, "I can tell you I had second thoughts about coming out here after I heard about the murder." ...."I bet. Well, I guess it can happen in the best of families." ...."The best of families!" That little disapproving sniff she gave was promising. .... "Like that, is it? ....She muttered, "They're all crazy, if you ask me." ...."Yeah? So you think one of them bumped off Godfrey?" ....She stopped stock still and laid a clammy hand on my arm. I believe she did it," she whispered. ...."She? Mrs. Beauchamp?" I gaped. ...."No. Her." Her voice dropped even lower. "The Princess." ....It took a moment to swallow back my initial reaction. I said as steadily as I could, "You think a mummy shot the butler?" ....Sally shrugged. "Stranger things have happened." ....Sally's expression reproved the laugh I was barely holding back. "This house is . . . well, there's something evil here, Nurse Kelly. You'll see. If you stay." ....I locked the door after the maid, changed out of the uniform and into dark slacks and a sweater, and sat down to wait. A lot of detective work is just that, sitting and waiting -- but you can't sell that to the pulps. ....Curled up in the satin-padded window seat, watching the blanched leaves flickering in the moonlight, it would have been easy enough to fall asleep. In fact, I think maybe I had nodded off when downstairs I heard a clock chiming midnight. .... I cracked open the bedroom door and peeked out. All quiet on the Western Front. I wondered if there was a dog. So many of these society dames keep lap dogs as fashion accessories or confidants or tax deductions. I listened closely. ...The wind soughed down the bedroom fireplace chimney. ....I snapped on my flashlight and stole downstairs. The house creaked and muttered about its arthritis while I trekked several miles of Oriental carpet and antiques under the painted eyes of generations of Beauchamps. There was no sign of anyone. I consulted the map in my head and, selecting a side room, slipped out through the French windows. ....The night air felt hot enough to ignite. ....I sprinted on the balls of my feet across the flagstone terrace at the back of the house, which turned into steps that led to an expanse of crispy lawn that gave way to more steps. The steps disappeared into a sunken garden. ....Sunken garden. This was where the butler got it. ....I kept my hand on the Mauser in my jacket pocket as I went down the stone stairs. Not that I'm the nervous type but something about the silence and gloom and smell of moldering earth gave me the creeps. ....Down in the garden there was a lot of broken statuary and a couple of ponds with deep brackish water fringed by overgrown plant life. At the far end was a kind of miniature temple with what appeared to be an Egyptian eye carved into the lintel. The eye of Osiris, if I remembered my college history correctly, which would make it about the only thing I did remember correctly. ....Three days after the homicide, there wasn't much else to see. The flat foots had trampled whatever clues there might have been along with the hydrangeas that formerly stood as tall as me. I stood there, concealed in the shadows of the peculiar temple, and tried to figure out what the butler had been doing out here that Sunday afternoon. ....Sunday afternoon seemed like an odd time to get yourself bumped off. ....A fish or a frog splashed suddenly in the pond, and I nearly shot it. I stared at the water. For a moment, the moon's reflection in the water looked like a face looming up behind me. Not pleasant. ....Disgusted with myself and the whole situation, I poked around a little more, mostly for form and not expecting to find anything, and then I climbed back up the stairs and sneaked back in through the French windows. ....After the bright moonlight, it was difficult to see. I could just make out the bulky shape of a desk and bookshelves. The smell of bitumen and spearmint mingled with the dry scent of the wind. As I fastened the catch, the silence of the house seemed to press in on me. For a moment I believed I wasn't alone, and the hair on the nape of my neck stood up. ....I turned to face the room. ....In the gloom the room seemed overcrowded with misshapen objects. Nothing moved and yet the stillness bristled. One thing for sure: Nurse Kelly couldn't afford to get caught prowling around after hours; I tried to think of a good excuse for my noctural prowl while I waited for someone to say something or snap on a light. ....My eyes probed the darkness but though the shadows seemed almost animated, nothing moved. ....So I should have relaxed. I didn't. ....My heart was skipping merrily along and my palms felt moist. I kept my hand on my gat. After all, less than a week ago, this place had hosted a murder. I didn,t want to be next on the guest list. What would Brannigan say? ....And then from the far end of the room came a queer shuffling sound . . .